Successfully Added Android Phone Xiaomi Redmi 4X - Snapdragon 435 CPU, 3GB RAM, 5 Inch HD Display, Dual-IMEI, 4G, Fingerprint, 13MP Camera (Gold) to your Shopping Cart. 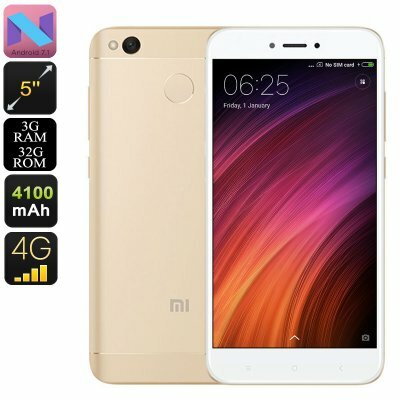 The Xiaomi Redmi 4X is an affordable Android phone that has been manufactured by one of China’s leading and most trusted electronics’ companies. Featuring a sleek body, this stylish Android smartphone truly is a feast to the eye. It runs on the MIUI 8 interface which has been based on Android 7.1, however, comes packed with an abundance of extra fun and useful features for you to customize your user experience. With access to the play store, this Chinese smartphone provides you with hours’ worth of free mobile entertainment to enjoy on its beautiful 5-Inch HD display. Underneath its crisp display that portraits all media in vivid color and great detail, this powerful Android phone holds the Snapdragon 435 processor. As an Octa-Core CPU, it has been designed to deliver a powerful yet energy efficient performance. With clock speeds up to 1.4GHz, it will allow you to engage in mobile games, watch movies, and enjoy the latest Android applications at ease. This affordable Android phone furthermore packs 3GB of RAM that allows all the multitaskers among us to enjoy numerous of the phone’s features at once without needing to worry about slowing down your Android device. Thanks to its epic 4100mAh battery, this Android smartphone delivers enough juice for you to enjoy a days’ worth of activity. With its Dual-IMEI numbers and 4G support, you’ll be able to enjoy connectivity like never before. The phone furthermore spoils you with 32GB of internal storage and a 128GB SD card slot through which it brings along plenty of memory for you to store all your favorite media, pictures, and Applications. Packing an ultra-fast fingerprint scanner, there will be no longer the need for you to remember annoying unlocking patterns or type in long passwords to open your mobile phone. With a gentle touch of your finger, this Android phone will provide you with access to all your files and applications – bringing along great efficiency. Additionally, the smartphone also comes with a 13MP rear camera for shooting amazing photographs and videos of all those upcoming adventures.